According to the National Oil Spill Commission investigating the Deepwater Horizon disaster in the Gulf, the White House blocked efforts by federal scientists to tell the public the worst-case estimates of the leak in late April or early May. That revelation and others were contained in new set of reports released Wednesday by the panel. The panel says that the White House Office of Management and Budget denied a request by National Oceanic and Atmospheric Administration scientists to release to the public its worst-case oil-flow estimates. Throughout the summer, the amount of oil gushing from the well was a slippery number to estimate, and part of why the NewsHour created its Gulf Leak Tracker widget. Over the course of several months after the rig exploded on April 22, the federal government slowly raised its public estimate of the oil flow rate — always a step or two behind independent and government scientists measuring the spill. And at one point the White House appears to have blocked efforts by federal scientists at NOAA to release to the public their worst-case spill rate estimates, the report finds. By initially underestimating the amount of oil flow and then, at the end of the summer, appearing to underestimate the amount of oil remaining in the Gulf, the federal government created the impression that it was either not fully competent to handle the spill or not fully candid with the American people about the scope of the problem. The commission also released three other papers Wednesday — one on the use of undersea dispersants, one on the potential challenges of oil-spill response in the Arctic, and one that criticized the decision-making structure and process within the federal government during the spill response. All of those papers are available on the commission’s website. The document below focuses on the fate of the oil. After leaks were first discovered on April 24, Coast Guard Adm. Mary Landry said that up to 1,000 barrels (42,000 gallons) of oil per day were flowing from the well. In its report, the commission found that that figure came directly from BP without supporting evidence. Four days later, the government upped its estimate to 5,000 barrels (210,000 gallons) per day. According to the report, that number was based on “an unsolicited, one-page document e-mailed to Admiral Landry’s Scientific Support Coordinator on April 26, 2010, by a NOAA scientist,” — a scientist who did not have extensive background in estimating oil flow, who acknowledged that his estimate was “very rough” and who only intended to make it clear that the 1,000 barrel estimate was too low. In late April or early May 2010, NOAA wanted to make public some of its long-term, worst-case discharge models for the Deepwater Horizon spill, and requested approval to do so from the White House’s Office of Management and Budget. Staff was told that the Office of Management and Budget denied NOAA’s request. Meanwhile, outside scientists began to question the 5,000 barrel estimate and to come up with their own estimates up to an order of magnitude higher — estimates that in the end were much closer to the final estimate of 62,000 barrels per day. Just days after the government released the 5,000-barrel estimate, Florida State University oceanographer Ian MacDonald reported that based on satellite images of the slick, oil was leaking at the rate of about 26,000 barrels per day. 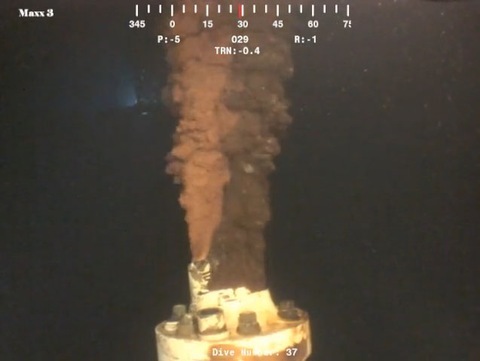 Then, when BP released a 30 second-video of oil gushing from the broken pipe in mid-May, independent scientists analyzed the video for news outlets including the NewsHour and NPR and put the flow rate in the range of 70,000 barrels per day. The initial success of the Flow Rate Group is questionable given that it did not release an arguably accurate flow-rate estimate until mid-June […] The Group’s estimates may also have suffered from a failure to disclose enough information to enable other experts to assess the group’s methodologies and findings. If more of the Group’s data had been made public, its estimates may have evolved more rapidly with input from the broader scientific community. And in fact, as we first reported, the government was at first slow to release the upper boundaries of some of the Flow Rate Technical Group’s own estimates. On Aug. 2, the government released the current estimate of 62,000 barrels of oil per day — produced by the Flow Rate Technical Group and a team working with Energy Secretary Steven Chu. Federal government responders may be correct in stating that low flow-rate estimates did not negatively affect their operations. Even if responders are correct, however, loss of the public ‘s trust during a disaster is not an incidental public relations problem. The absence of trust fuels public fears, and those fears in turn can cause major harm. In a statement Wednesday, National Oceanic and Atmospheric Administration chief Jane Lubchenco and White House budget director Jeffrey Zients pointed out that in early May, Interior Secretary Ken Salazar and Coast Guard Adm. Thad Allen told the public that the worst-case scenario could be more than 100,000 barrels, or 4.2 million gallons, a day, according to The Associated Press.